ROBERT HENNEKE is the General Counsel and Director of the Center for the American Future at the Texas Public Policy Foundation. Before joining the Foundation, Robert served as the twice-elected Kerr County Attorney where he brought conservative values to county government. 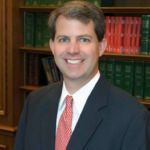 Robert began his legal career serving as an Assistant Attorney General in the General Litigation division under the leadership of Texas Attorney General Greg Abbott. Robert has appeared on national news shows, such as Fox News, Fox Business, MSNBC, and others. His commentaries have been published in Fox News, Forbes, The Washington Post, The Washington Examiner, The Hill, and other national publications. He is a member of the State Bar of Texas and is admitted to practice before the Supreme Court of the United States, the Fifth Circuit Court of Appeals, the Seventh Circuit Court of Appeals, and the Federal District Courts in the Eastern, Western, Northern and Southern Districts of Texas. Robert received his law degree from the University of Texas School of Law where he founded the Texas Law Republicans. He earned his undergraduate degree in English Literature from Georgetown University. Robert graduated from Tivy High School in Kerrville, Texas. He lives in Austin with his wife Lesley and their two sons. Robert is an Eagle Scout.